Lighting rules. Is this best way? My room with the actual toilet..
Is there a better way to do this or is it fine? The rest of the bathroom (4 other lights) gets a lot of natural lighting so I only need motion activation for the toilet room and the others at night. So they're already separated this way. Here is mine for my downstairs bathroom. It uses motion and light level. All done with one rule and I would suggest you do it this way or something very similar. EDIT: I should have mentioned that by using one rule, if motion goes inactive and the pending starts to count down, then before the timer to turn off has matured and motion is detected again, then everything resets. So in theory you could be moving about for any amount of time as long as motion is detected before the pending timer expires. You probably knew this but I just thought i would mention it. All of my motion lighting rules are at least two rules if not more because I have more conditions for turning them on and for turning them off. 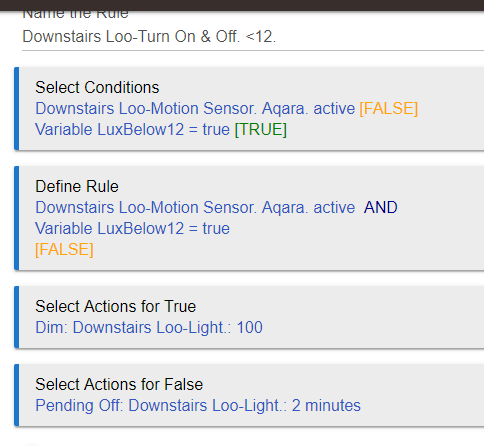 For example, since I am setting the dimmer level with the motion rule, if the light is already on, i don't want the motion rule to change the dimmer's level back to what it wants it to be if I have changed it manually. I also use the dimmer level as an override for preventing the light from turning off...for example, in my bedroom. Lack of motion only turns the light off if it's over 90%. I have the light dimmed if i'm in bed watching tv and not moving as much. So, as your motion rules mature and develop you will probably have to split them out into separate rules. But you can start off with them both in the same rule. You just can't have different conditions for off and on. You only have true or false for all conditions.